One of the challenges of making large batches of beer is making sure you have enough yeast to get a healthy fermentation going. According to the yeast pitching rate on MrMalty, I will require 4-8 yeast packs to make sure I have enough yeast for a ten gallon batch. Why not make a yeast starter you can drink? I decided I want to make a large batch of California Common, so I knew I wouldn’t be able to just pitch the vial of WLP810 into ten gallons of wort. Mr Malty said I would need a 7-liter starter, which is just under two gallons. 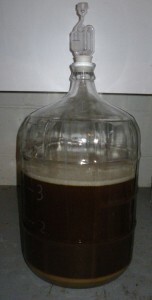 So I decided to make a small batch of beer to use as the starter. This way, at least the starter can be enjoyed rather than just decanted down the drain. Looking at my pile of ingredients, I figured I could shoot for a 3.5-gallon batch of a low-gravity beer using the brew-in-a-bag technique. This recipe did not come from a book or web site, so I have no idea how it will turn out. I just had some ingredients I wanted to use. I heated 4.2 gallons of water to 162 degrees Fahrenheit, then added my grain into the bag and stirred to break up any clumps and get a nice even consistency. The temperature dropped to 154 degrees. I put the lid on my kettle and let it sit for fifty minutes. After about 40 minutes, I drew up 1.8 gallons of water and heated it to 180 degrees for mash out. At 50 minutes, I took the grain bag out of the kettle. The temperature had dropped to 151 degrees. Placing the grain into the 1.8 gallons of water and stirring it up again, I let it sit while I got the burner going under the main water. 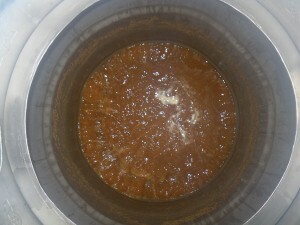 After about 5 minutes, I lifted the grain out of the smaller pot, let it drain and added the wort into the main kettle. I boiled and chilled normally, racked into a five gallon carboy, pitched the yeast and shook it up. Then I placed the carboy on the floor in my basement so the temperature would stay slightly cooler than the air temperature of my basement. I understand the purpose of a yeast starter is to get a strong colony of yeast ready to ferment your beer, but why not let it server more than one purpose? If you have the time to make a batch of beer for your starter, you can get a little beer and some healthy yeast. Sounds like a good deal to me. Next Next post: Protect Your Beer!